Just downloaded some wonderful songs on your computer and want to import them to your iPhone for listening on-the-go? Then you get the right place, in the following article, we will show you two easy yet helpful ways to transfer your music from computer to your iPhone. When it comes to transferring music from computer to iPhone, the first thing that jumps into our mind is to turn to iTunes for help. 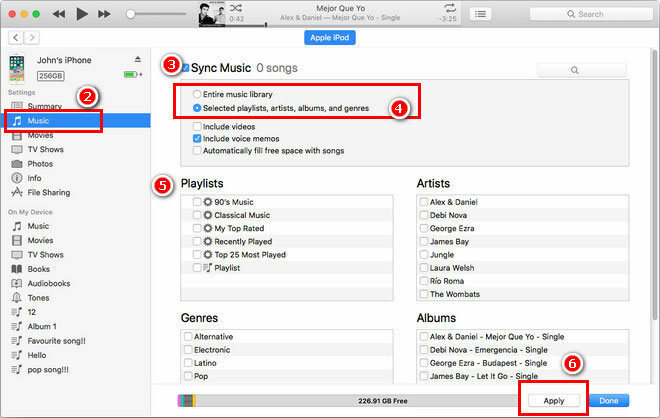 With iTunes, you can sync your music, movies, TV shows, photos and more from PC/Mac to iPhone. Here are the detailed steps. Step 1: Connect the iPhone to your computer using the provided dock connector. Step 2: Launch the iTunes software. Under the Devices section in the left window pane, click on your iPhone. Step 6: To start transferring music to your iPhone, click the Apply button to start syncing. Step 7: When the syncing process is complete, disconnect your iPhone. 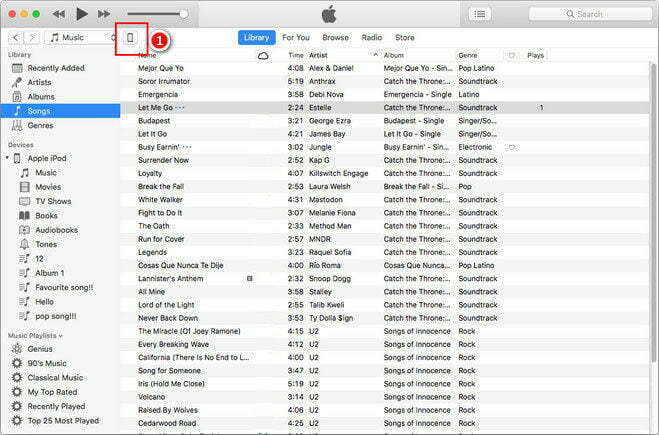 Tips: if the computer is signed into the same iCloud account with your iPhone, you can also turn on iCloud Music Library to sync music. iTunes is probably the first tool when people are talking about iPhone data transferring, but normally, we do not recommend to use it, as iPhone can be synced with only one iTunes library at a time. 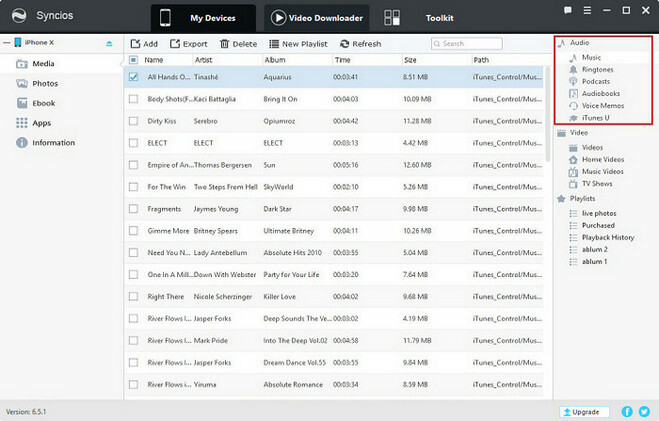 If you already made it on other computer and want to transfer music from this PC to iPhone, you will lose everything on your iPhone. Thus, to transfer music from PC/Mac to iPhone without any data loss, you need a good iTunes alternative. Here you are recommended to use Syncios iPhone Manager. It is a free and helpful iOS device manager, which helps you sync all types of files between your computer and your device. With this handy manager program, we can easily transfer any of your media files on computer to your iPhone without iTunes. Step 1: Launch Syncios Manager on computer and connect iPhone to computer. Step 2: Click Media button on the left panel of Syncios, then click Add button on the top left corner. You can choose "Add file" or "Add folder" to iPhone. After selecting the music folder, click Open to import the music to iPhone. All Apple Music streams are DRM-locked, which restricts you from listening to downloaded Apple Music tracks after canceling subscription. To keep your downloaded Apple Music songs forever on your iPhone, you should remove DRM from Apple Music songs. 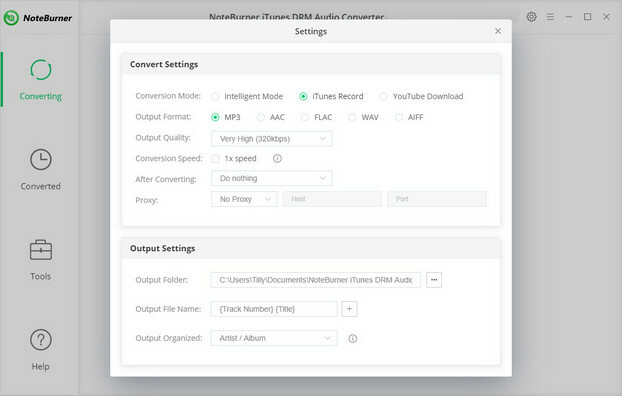 Here you meet NoteBurner Apple Music Converter, a powerful yet easy-to-use Apple Music DRM removal tool that can help Apple Music users strip DRM restriction from Apple Music streams while converting the locked songs from M4P to MP3, FLAC, AAC or WAV format at 10X speed. Besides, it is capable of downloading Apple Music tracks without damaging the original streaming audio quality. 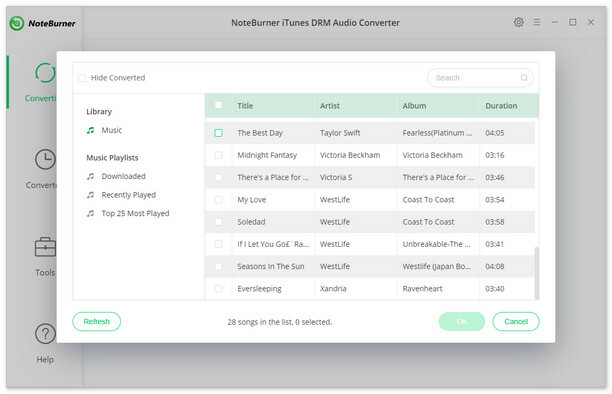 With the help of this powerful tool, you can easily download songs from Apple Music to MP3 or other widely-used formats, and then keep on your iPhone forever. After conversion, click the "History" button in the main interface to find the output audio. And then launch iTunes or Syncios to transfer these converted Apple Music songs to your iPhone for streaming.